← Gardening in autumn sunshine, listening to Bob Brown and buying an unknown plant. The final working party of the year at the lottie site at the weekend. The hardy members worked hard under dull November skies stopping frequently for coffee and laughter. We cleared our list of jobs to be done so went home exhausted, aching but satisfied. 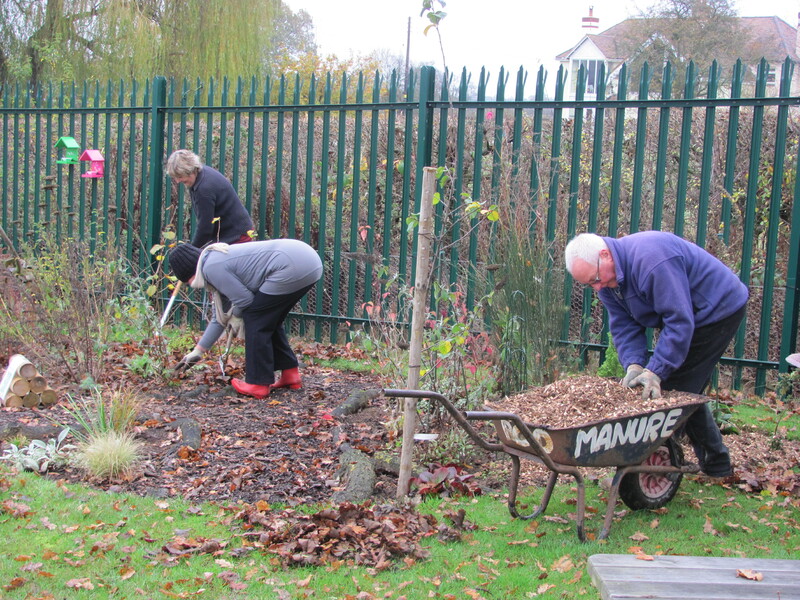 The first job was to weed the Summer Garden, collect up the fallen leaves, give the roses a good dose of good old-fashioned cow muck and finish off by mulching the surface with woodchip to protect the bed from the winter cold and rain. One of the Charles Darwin rose bushes was still in flower so gave a glimpse of yellow and a burst of scent as we worked. 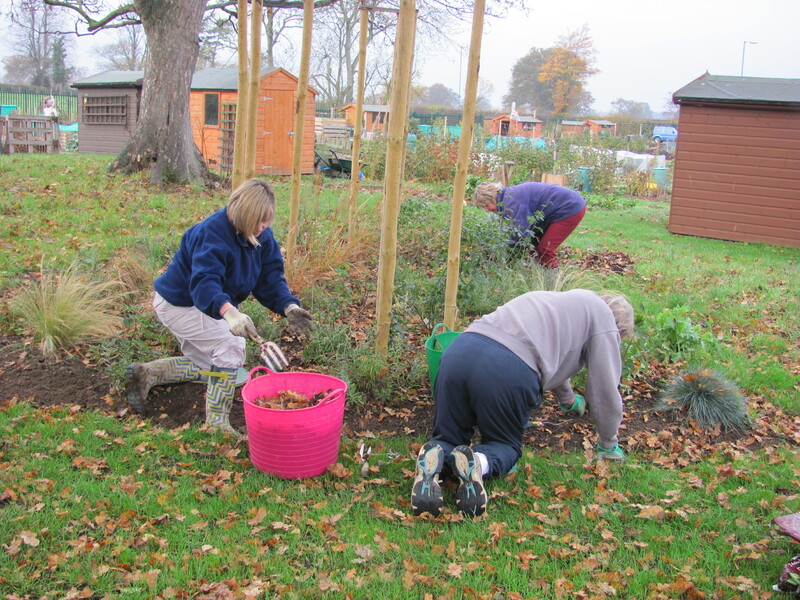 We then treated the three Buddleja Beds and the sensory garden to a weed and mulch. So now all the beds on the site have been weeded and have a protective duvet of woodchip on them. 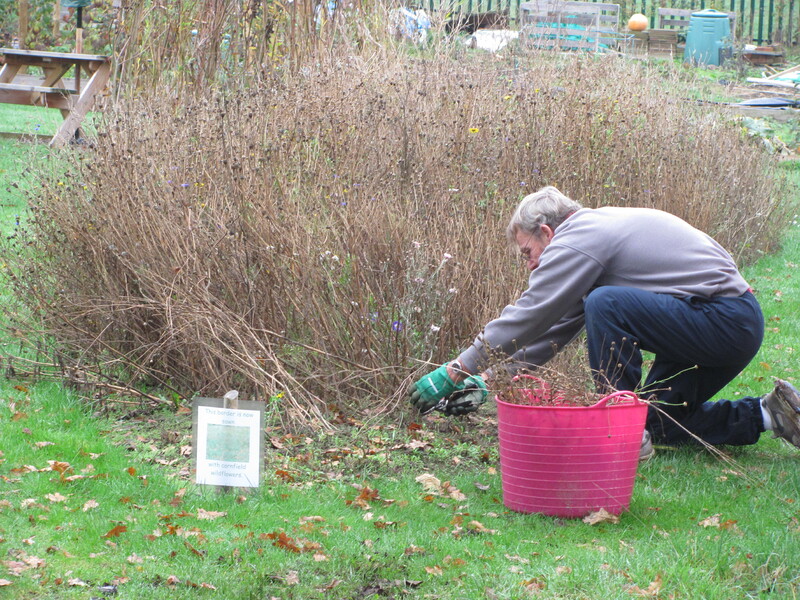 We then split up with Geoff giving the small meadow a haircut and weed. We were amazed by how many seedling of wildflowers decorated its surface. this job would normally be done much earlier in the year but this meadow has only just finished flowering. The rest of us planted bulbs in one of our orchards including Camassia and crocus, and took hardwood cuttings of coloured stemmed dogwoods and willows. This entry was posted in allotments, autumn, community gardening, gardening, grow your own, meadows and tagged allotments, autumn, community gardening, meadows. Bookmark the permalink.